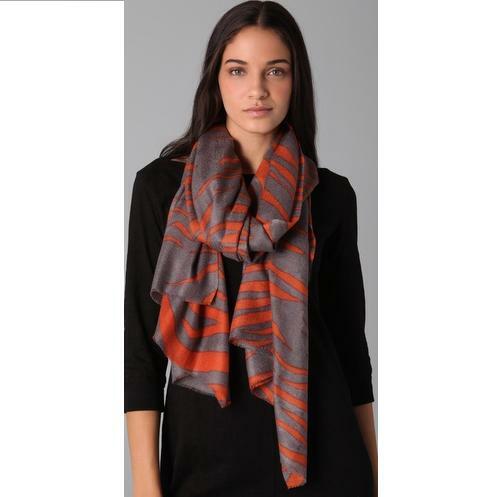 This cashmere gauze scarf in Tiger pattern features a tiger stripe print and fringed ends. One size. * 3′ wide by 6.5′ long. * 100% cashmere Tiger print. YARNZ, an international boutique design house specializing in exquisite, top-grade cashmere, fuses ancient craftsmanship and traditions with innovative designs to create a sensuous, luxurious range of world-class cashmere products. Founded by a family from Kashmir, India, YARNZ cashmere is crafted in an enduring legacy of high standards. The fine hairs are sourced in the spring months in Mongolia, and then meticulously dyed and spinned, creating classic staples with a modern, contemporary twist.